The Jara High Frequency instrument is to speed up the circulation of the blood, stimulate glandular activity, remove bacteria and ease the penetration of cosmetic products. It uses high frequency to kill bacteria on the skin’s surface and aid in product penetration. 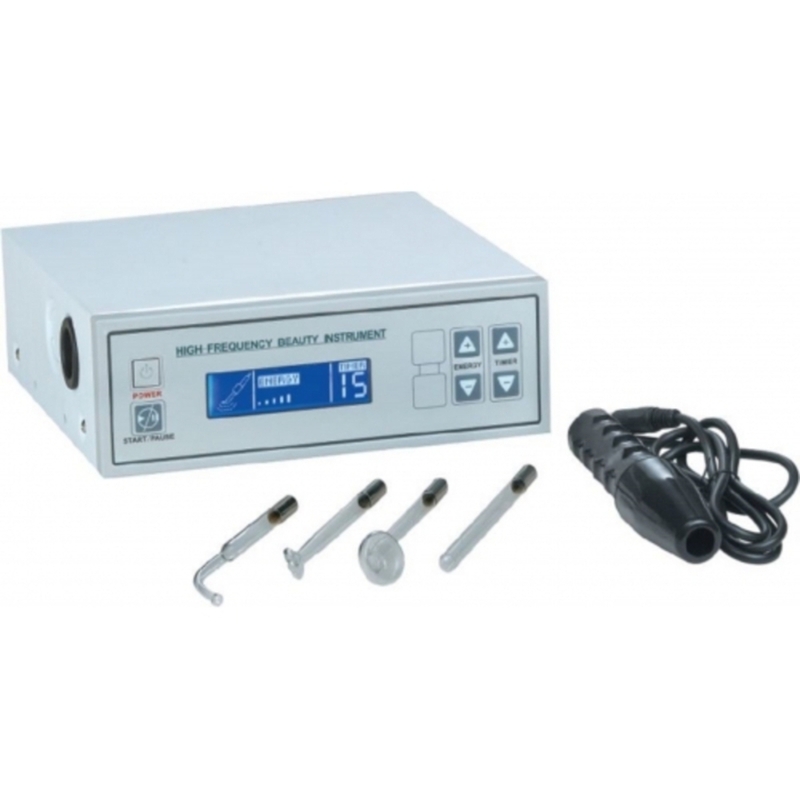 Includes base unit, high frequency handle, acne electrode, spoon electrode, mushroom electrode, and indirect electrode. The high-frequency unit is used as one of the final steps of a facial after extractions. Depending on how it is used, it can be warming and soothing, or stimulating. It can also deliver a mild antiseptic effect. A high-frequency current is a current that alternates very rapidly – in the range of 100,000 or greater hertz. A high frequency current passes through the body very easily, exciting the water molecules in the body. They begin to vibrate very rapidly, warming the body tissues. Creates germicidal action – During the direct method, the electrical current generates ozone, which has germicidal properties, helping kill bacteria on the skin. Direct – The esthetician places the electrode directly on the client’s skin and moves it gently over the skin. High-frequency energy is discharged into the skin at the point of contact. The direct method both warms and stimulates the skin. Fulguration/acne sparking - The esthetician holds the electrode a short distance away from the skin, producing a spark that can help promote healing.